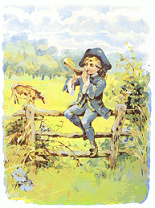 The earliest printed version of the Little Boy Blue lyrics was in Tommy Thumbs Little Song Book around 1744. 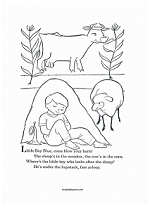 While learning this rhyme we talked about how everyone must do their part and if Little Boy Blue had not been sleeping the animals would not have wandered away. We also discuss how high the dishes in the sink, the laundry or messy wastebaskets would get if no one took care of them. One Mom told me that her son started thanking her when she completed household chores at home. Another Mom said her daughter was helping out more. So... a couple of parents were quite happy their children had learned this particular rhyme. Looking for a fun game to go with the rhyme? 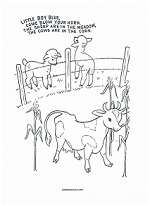 This is a fun rhyme to act out with several children. Turn the rhyme into a twist on hide and seek. Start by giving one child a blue hat and plastic horn. The others pretend to be sheep or cows. 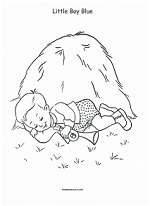 The child who is playing Little Boy Blue pretends to sleep while the others hide. The last child found gets the hat and horn for extended play. Print out as many as you need. 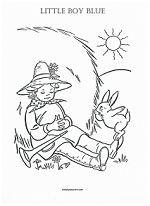 Adding a coloring page will help reinforce the learned rhyme.